Getting your bachelor’s degree is a great career move. Read about Maine colleges with the highest-paid graduates before you choose a school. 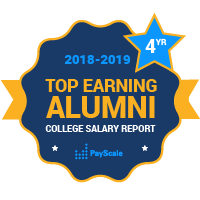 There are several colleges and universities in Maine included in PayScale’s College Salary Report. Our list of the Maine colleges with highest-paid graduates can help you make a smart decision about where to earn a bachelor’s degree. Some of the most notable colleges in Maine are Saint Joseph’s College, University of Maine, and University of Southern Maine. Colby College is consistently among the best four-year colleges in Maine. This tiny private liberal arts school has about 2,000 students enrolled, but Colby alumni thrive. Colby is almost always ranked in the top 100 of schools overall in the nation measured by median alumni salary. Many graduates from Maine’s colleges go on to work in careers in the Agriculture, Shipbuilding, Fishing, Footwear, Machinery, Electronics and Tourism industries. Popular employers for Maine graduates include University of Maine; Army National Guard; Maine Medical Center; Children’s Medical Network; University of Maine Systems; Maine General Hospital-Seton; Eastern Maine Medical Center; Unum; Maine General Health-Medical Center; and the University of Maine.